You won’t usually hear wine public relations or marketing people use the word ‘catastrophe’ either in English or French, but I am beginning to wonder whether the meaning is subtly different in contemporary French. In the past few weeks I have heard the word used by the smallest and the largest, and by both the most insular and the most worldly of Jura producers to describe the 2013 vintage. They are usually pretty honest with me, but this seems extreme. ‘Cata’ is short for ‘catastrophe’, and when pronounced in French either ‘CaTa’ or ‘catastroff’ with the emphasis on the ‘stroff’ it comes over with some impact. This shocking word was used by Stéphane Tissot when I spoke to him on his mobile phone on his last day of harvest this year on 14 October. Then last Monday I heard it several times from organic producers, both established and relatively new, in Paris for Le Nez dans le Vert trade tasting, even though they all wore a brave little smile. Then I spoke on the phone to the director of the large négociant Maison du Vigneron (part of Grands Chais de France) and tentatively asked about the harvest, couching it with ‘I know quantity is low and it hasn’t been easy, but how was…. ?’ And yet again ‘catastrophe’ was the answer. To be fair, a few bright souls gamely admitted that Jura was at least lucky to be spared the horrific hail storms that nearby Burgundy suffered. So, what went wrong? This is not about quality but about quantity. As debates continue in the world of wine about a worldwide shortage of wine (is there or isn’t there? 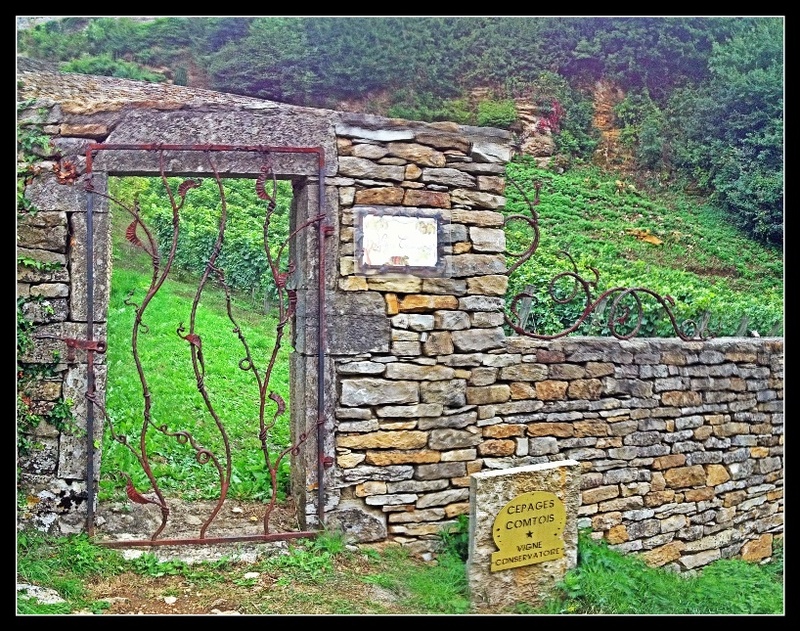 ), amongst the most successful producers of the Jura wine world there will be a shortage of certain wines, no doubt. There have now been two seriously small harvests in a row, 2012 and 2013, which for some producers added together hardly equate to a normal harvest level. The 2011 vintage was generous, 2010 not very big, and so it goes on, with vintages more and more like a yo-yo in terms of quantity. The winter 2012-2013 was long with unusual amounts of snow and spring was slow to start. At first producers were upbeat as they knew that this meant less risk of dangerous spring frost. However, when the cold continued into May, they began to get worried as the vines were hardly starting to grow. Towards the end of that month it was not only still wet, but seriously cold for the time of year. And then the Savagnin ‘did a runner’! I was perplexed when vignerons with a wry smile told me ‘les Savagnins ont filé’ as although I vaguely understood the verb ‘filer’ I did not know the expression ‘filer à l’Anglaise’ and I just could not relate it to vines. 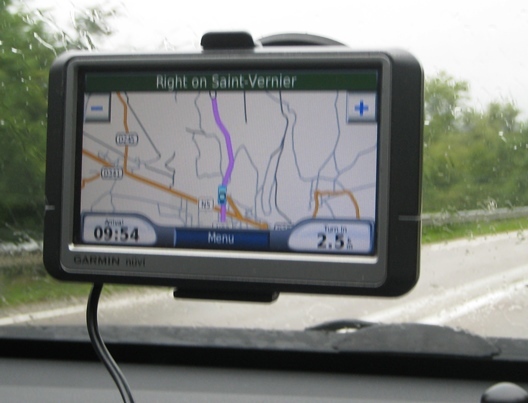 It turns out that ‘filer à l’Anglaise’ means the same as ‘to take French leave’ or to do a runner. Before actual flowering, the small clusters that had formed on many Savagnin vines simply fell off because of the cold. It also happened to a lesser extent with some Poulsard and Trousseau vines. Some Savagnin vines were left with no flower clusters at all (so no grapes) and others with just one or two remaining. Just a few protected or warmer vineyards escaped the problem completely. Eventually flowering began at the end of June/early July depending on variety, about four weeks later than in most recent years, but the weather was still not very kind and there was much coulure, and as in 2012 once again it was worst for Poulsard. 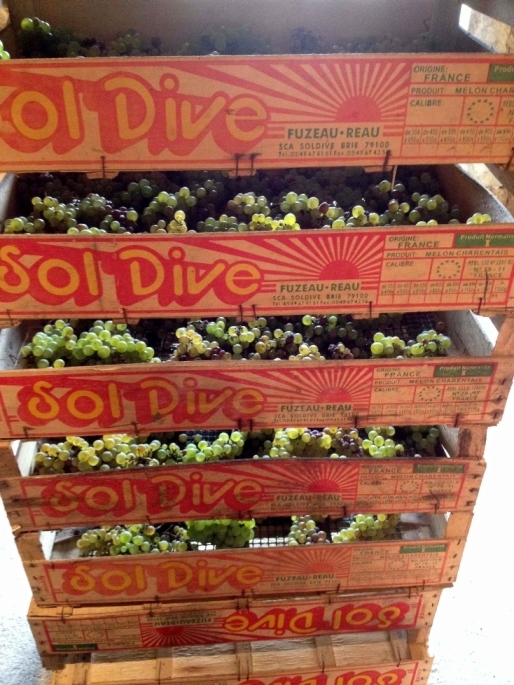 With the low quantity, producers were resigned to keeping their fingers crossed that at least there would be good summer weather, and indeed there was warmth and sunshine for almost two months in July and August. Upbeat, the growers did not mind a little rain in early September, as that gives the vines a drink and increases the volumes a little, but they did need more ripening time, forecasting harvest would be spread along the whole of October. The ban de vendanges (the permission to start picking) was set for 23 September for grapes for Crémant, and a week later for still wines. Most good producers were prepared to sit it out for much longer, but then bad weather was forecast. The whole harvest was stop-start, dodging not just rain showers, but heavy downpours at times. Suddenly grey rot started appearing and looked ready to become rampant. The vignerons rushed to get the grapes in as quickly as possible, even the Savagnins that are usually hardy enough to be left for much longer had to be brought in rapidly. Most finished picking by 12 October or soon after, and of course they had to be selective too, but there was so little quantity to pick, at least they could do it quickly. The final tally is usually given as an average yield per hectare. An average yield for the co-operatives and large producers would be 55-60 hectolitres per hectare (hl/ha), sometimes more than this for those who pick a lot of grapes for Crémant du Jura where yields may be higher. Both the Fruitière des Vignerons d’Arbois (co-operative) and the Maison du Vigneron averaged somewhere between 30 and 35hl/ha taking into account Crémant. As for most of the organic and other producers who aim to achieve more flavour concentration through lower yields, practicing shorter pruning and bud-rubbing, they ended up with between 10 and 25hl/ha but most were well below 20hl/ha. Because there was relatively little mildew this year, the quality has ended up as fairly good overall – most producers are saying it was better for reds, but Chardonnay suffered with some rot, and there was so little Savagnin it hardly counts (5hl/ha for some vineyards). Especially for the many small, quality-minded young producers who have set up in the past five years, this situation is really hard. Many have found keen customers both at home and on export markets eager to buy their wines, but they now can offer no follow-on for certain cuvées. It has to be said that this is exacerbated by the current Jura trend to offer a huge range of cuvées (several producers have upwards of 20 different wines even owning just 5ha of vineyards or less), but that is part of the joy of Jura. There is absolutely nothing they can do except make the best quality wines they can manage, and hope that financially they can make it through the next few months. Nature usually regularizes things and after particularly small vintages, the vine is ready to produce a bumper crop the following year. 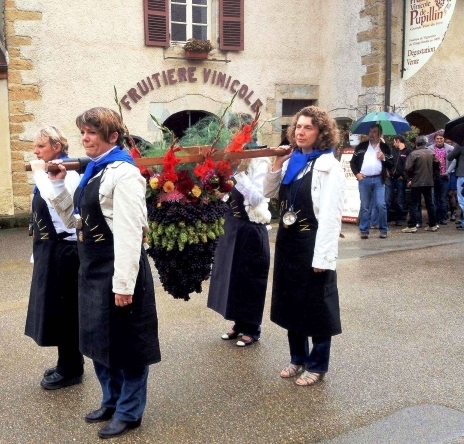 Many vignerons thought that this would be the case after the small 2012 vintage, but in fact 2013 was worse – they simply cannot afford to have another poor vintage in terms of quantity, or indeed quality. To avoid an even bigger catastrophe we have to all think positive thoughts for 2014. Last month on my very last full research visit in preparation for the book, I spent most of the time around Château-Chalon, visiting producers there and in Ménétru-le-Vignoble, Névy-sur-Seille, Voiteur and Le Vernois. 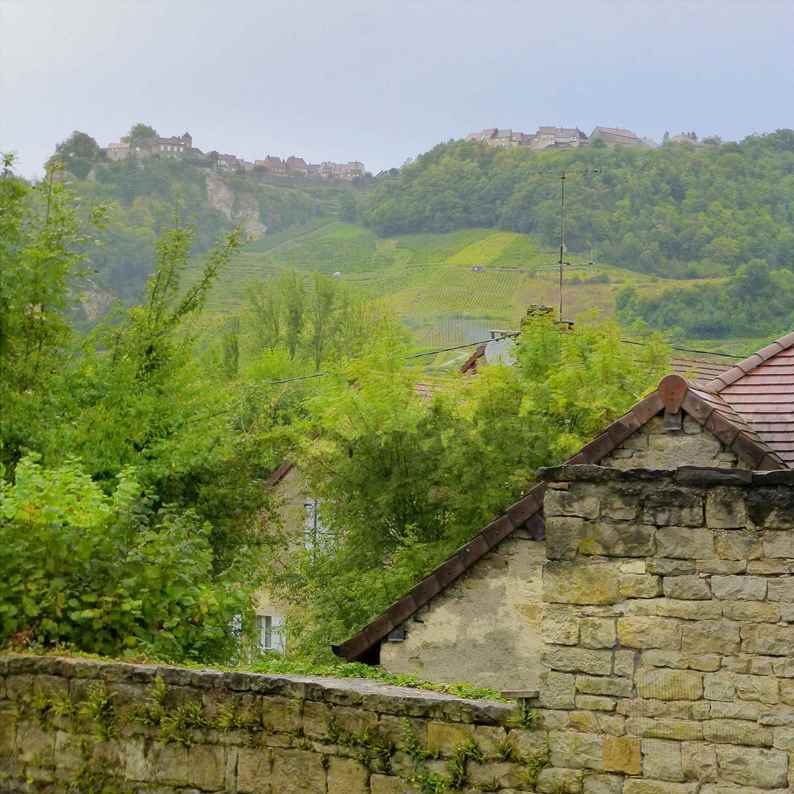 Only 20 minutes south of Arbois, this is in many ways another world, where Savagnin and oxidative wines reign supreme, born of the classic, steep grey marl vineyards below the limestone cliffs of the historic hilltop village of Château-Chalon. As well as visiting producers, we were able to sneak in behind the fancy metal doorway to the baby vine conservatory looked after by Gaël Delorme of the Société du Viticulture du Jura. Here, around 50 vine varieties are grown, including not only various versions of Jura’s big five, but all the obscure varieties Gaël has been able to find over the past ten years that were once grown in the region. This include rarities such as Enfariné, Argan, Gueuche Noir and Poulsard Blanc, some of which make their way in tiny quantities into blends made by a few producers. You will have to wait for the book to know more. We also took a look at the wonderful educational museum of la Maison de la Haute Seille in the middle of the village. If you understand French it’s well worth spending an hour there to look at the interactive displays explaining the geology of the place, as well as history and much more. There is also a beautiful garden with one of the many spectacular Château-Chalon viewpoints over towards the Bresse plain. In between both of our birthdays we treated ourselves to a meal at the Restauarant Hostellerie St-Germain d’Arlay that I hadn’t eaten at for some time, and has recently had a makeover, although still with the same owners, the Tupins. It was a really excellent meal, the restaurant is worthy of a Michelin star, but for now doesn’t have one, which is probably good for prices. 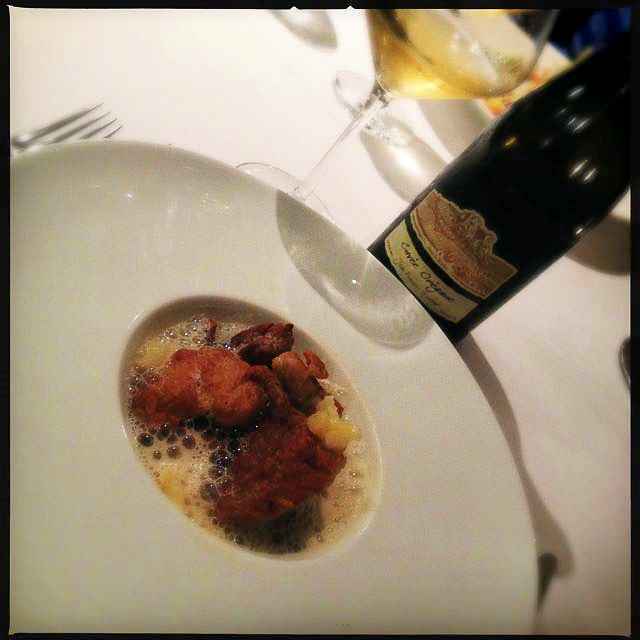 The dilemma of what to drink was ever-present, but after an aperitif of elegant Crémant from Michel Gahier, we decided on a great value Ganevat Cuvée Oregane 2010 – his Savagnin/Chardonnay blend. I rarely get to drink Ganevat, and on visits to him it’s usually a barrel rather than bottle tasting, so this was the ideal opportunity to relax with a bottle and good food – lovely purity of ripe yellow fruits dominated. Back in Château-Chalon, when we were there in mid-September the Savagnin grapes were a long way from ready, although the very low crop, caused by problems earlier in the year with cold and rain before and during flowering, means that with the September sunshine they can ripen quicker. Château-Chalon is the only AOC in France to have three quality control examinations – once at the vines before harvest, once as wine in vat and a final one after the requisite years of barrel ageing under the veil, before bottling in its special Château-Chalon-engraved clavelin. 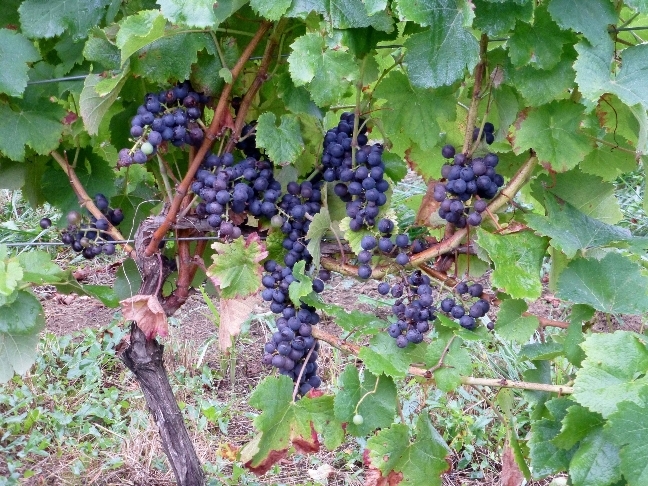 The inspection committee toured the vineyards of Château-Chalon, checking the grapes for ripeness and health, yesterday 3rd October and have declared the vintage suitable for making the AOC in 2013 (not as in 2001 last time it was rejected). Picking may begin next Wednesday 9th October, though I expect many will wait longer if the weather permits. With the pressure of writing and the distance from my home, I could not attend the inspection, so instead celebrated with a glass of delicious, delicate and elegant Domaine De Lahaye Château-Chalon 2005 from Guillaume Tissot of Névy sur Seille – open over two weeks and just hitting its best! Do take a look at the old news reel video of Harvest in Château-Chalon 1968 for a taste of nostalgia and the romance of harvest. And then you might like to view my offering, shot from above the village of Névy-sur-Seille and showing all the vineyards of the four villages eligible for AOC Château-Chalon, which also include Ménétru-le-Vignoble and Domblans.